Actvity Summary: Life doesn’t get much hotter than this! 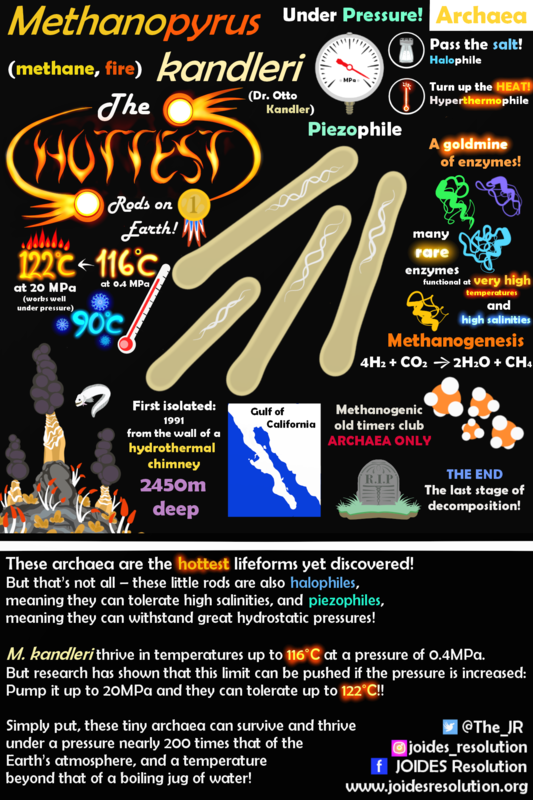 This poster highlights the current world champion hyperthermophile: Methanopyrus kandleri. But that’s not all – this rod-shape archaea is also halophile, meaning it can tolerate high salinities, and piezophile, which means it can withstand great hydrostatic pressures. 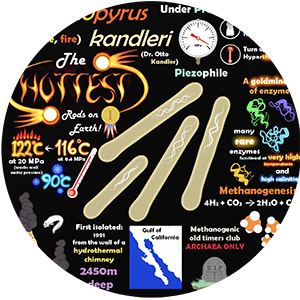 M. kandleri thrives in temperatures up to 116˚C at a pressure of 0.4MPa. Recent research has shown that this limit can be pushed if the pressure is increased! Pump it up to 20MPa and they can tolerate up to 122˚C!! Simply put, these tiny archaea can survive and thrive in both a pressure nearly 200 times that of the earth’s atmosphere, and a temperature beyond that of a boiling jug of water!